This was our third National Geographic Lindblad sailing. We have done Alaska, Galapagos and now Baja. This sailing we had two cabins a Category 2 and a Category 3. The 3 is a little larger but still small which is to be expected on an expedition ship. As with all our sailings everything was on point and done perfectly. Flights in and out and transfers not a hitch. Ship has had some upgrades and looks nice. Crew were all veterans and the whole machine of the cruise was well greased so to speak. Food great, fellow passengers an interesting group. Hiking in the desert was very interesting with our naturalist pointing things out. Without him it would have been a boring walk. He provided education on sand dunes, cactus forest and cactus really does come down to the ocean. 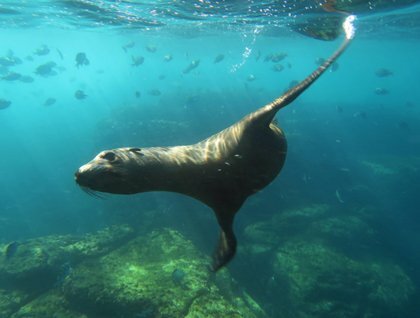 Our time swimming with the sea lions was great. They play with you, is the only way to describe it. They swim right for you mask and then turn and rarely touch you. One of the passengers didn't follow directions and kept a silver shinning barrette in her hair. I guess it flashed under water or sumthin because the sea lions seemed to circle her. The Naturalist asked her to take it out and all was fine. Kayaking was fun and the water was not cold but I wouldn't say warm either. Some jumped in. All this is fine, but the highlight and why you do this cruise at this time of year is for the birthing of the whales in Bahia Magdealena. Oh my gawd, what can I say. The whales, adults and babies are everywhere. They swim up to your panga, you can pet them, kiss them, touch them, take their very close up photos. It is just amazing the interaction mostly of the curious playful babies. We spent days, I could have spent weeks. All in all and excellent trip. I might mention we did have some rocking of the ship as you round the bottom of Baja.